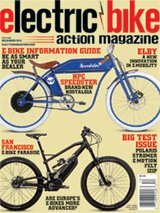 Troy Lee Designs, Bosch e-Bike Systems and Electric Bike Action present the fourth Electric Boogaloo race this year at Northstar in Lake Tahoe, California. Join the fun, ride various great e-bikes on the course for free during the demo, and sign up to race. There are fun prizes (including great Bosch tool sets), great racing, and a pro purse! Come join us, sign-ups are still open.